Stan was an English major. He'd studied four years and was proud of his personal prowess when it came to his phraseology. That's vocabulary to you and me. He wasn't bad with the Sunday Times crossword puzzle either. He was making his way through the latest word challenge as he sat in Starbuck's sipping an espresso. The shimmering sunshine slipped through the open window casting the shadow from his pencil placidly upon his newspaper. 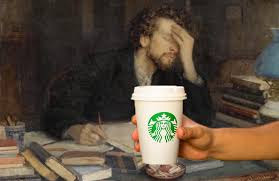 And if it weren't for the occasional bawl of the baristas seeking to match a coffee cup with a customer, the subtle drone of patrons made him almost doze off. Stan thought the interior of the coffee shop was idyllic. Idyllic was a favourite word of Stan's and he often felt his surroundings to be idyllic, an outlook in keeping with his ultra-positive look at life. He also had great ardor for alliteration, in case you hadn't noticed. And then there was Oliver. Oliver was a good friend of Stan's - the best perhaps. But Oliver was very different from his friend. Oliver never finished university. Instead he'd spent most of his time in the student lounge drinking beer and playing pool or checkers with his unacademically-minded buddies. As a result Oliver worked at a blue-collar job while his pal Stan was easily climbing the ladder of success. Oliver, earbuds of his iPhone plugged solidly into his ears, yelled a greeting to Stan and as he sat down and spoke loudly he turned the formerly idyllic coffee shop into an impious, cacophonous cavern. Loudly to you and me. But to Stan Oliver was rowdy, strident, raucous, vociferous and particularly stentorian. You might say he spoke in a manner so loudly he could have wakened the daed. But then I think you got that already. Alarmed and annoyed at having his quiet and discreet refuge interfered with Stan looked Oliver in the face and yelled at his friend. But Oliver, deep into his music, did not hear. After the third attempt Stan yammered at the top of his voice "This is another fine imbroglio you've gotten us into". "Hey" replied Oliver. "How did you know I was listening to Natalie Imbroglio?" You might say Stan was torn as he thought about hauling off and launching a bell-ringer at Oliver's clearly cavernous cranium. This week's Two Word Tuesday prompt from Tara is imbroglio/mess. My apologies to Stan and Ollie for paraphrasing their well-known catch phrase.